With the issuance in August of the fuel efficiency and greenhouse gas standards for cars for model years 2017–2025, the Obama administration may have now put forth the last major Environmental Protection Agency rule of its term. Starting with a comprehensive analysis in May 2011, EPI has issued a series of analyses which have found that contrary to much of the political commentary, these rules will be of great benefit to the nation, improving public health considerably without harming the economy or employment. Altogether, under the Obama administration, 10 final major rules have now been issued by the EPA and three final major rules issued jointly by EPA and the Department of Transportation. To examine one way that the impacts on society of those rules are assessed, I add up their ultimate annualized cost and benefit figures. It bears mentioning that costs and benefits are phased in over time, can jump around for individual rules from year to year, and a considerable portion of the impact of the rules will not occur until five years or more from now. Thus it is best to think of the figures as annual averages over time, but not representative of a particular year. The benefits of the finalized Obama EPA rules are valued at $144 billion a year (all figures in 2010 dollars). Most of the benefits come from saving lives and other health benefits. They also include benefits such as substantially reduced fuel expenditures by consumers or increased worker productivity (because workers are healthier). The compliance costs of the Obama EPA rules ultimately amount to about $26 billion a year. In combination, the annual costs equal only about 0.1 percent of the economy—or one-thousandth of the economy. Compliance costs of this magnitude should not be expected to dramatically influence economic growth or employment in one direction or another. The net benefits from these rules total $118 billion a year. Benefits exceed costs by a ratio of 5.5 to 1. Using methodology I wrote up previously, I estimate that the economic benefits from the joint EPA/DOT rules alone (fuel efficiency and greenhouse gas standards for vehicles) exceed $37 billion a year, or more than the compliance costs for all 13 of the Obama rules examined here. These economic benefits consist nearly entirely of consumers having to purchase less gasoline. From a health perspective, less gasoline consumption also means less air pollution, smog, greenhouse gas emissions, and disease. The underlying health benefits from all of these rules (monetized in the above calculations) can also be assessed in terms of lives saved, hospitalizations avoided, and other human impacts. For example, the Mercury and Air Toxics rule is ultimately expected to have the following benefits: 4,200–11,000 lives saved (which the EPA describes as “avoiding premature mortality”) every year; 4,700 fewer non-fatal heart attacks every year; 5,700 fewer hospital and emergency room visits annually; 140,000 fewer cases every year of respiratory symptoms; and 540,000 fewer days of work lost to sickness, again each and every year. My colleague Josh Bivens undertook a comprehensive study of the effects of the Mercury and Air Toxics rule on employment. He found it would actually result in a modest net increase in employment, with this increase equal to about 117,000 jobs by 2015. Bivens examined all the possible positive employment effects (mainly that jobs would be created by compliance investments) and negative employment effects (mainly, jobs lost due to higher energy costs that lead to reduced sales), and found the positive effects would outweigh the negative employment effects. In assessing this cost-benefit information, it should be kept in mind that the data are not precise, and that there are many limits to such analysis (for example, many benefits are not monetized). Nonetheless, the magnitude of the net benefits of the Obama EPA rules shown by the data indicates that they are likely to be of great value to the nation. And the modesty of the compliance costs—both relative to the size of the economy, and because they are outweighed by the rules’ economic benefits—drives home that the oft-repeated claims that EPA regulations damage the economy are sorely mistaken. Notes: The table focuses on EPA rules finalized during the Obama administration that can be considered "major" (generally, with annual economic effects of $100 million or more). The table excludes the Boiler MACT rule, which was finalized but is being reconsidered by EPA. 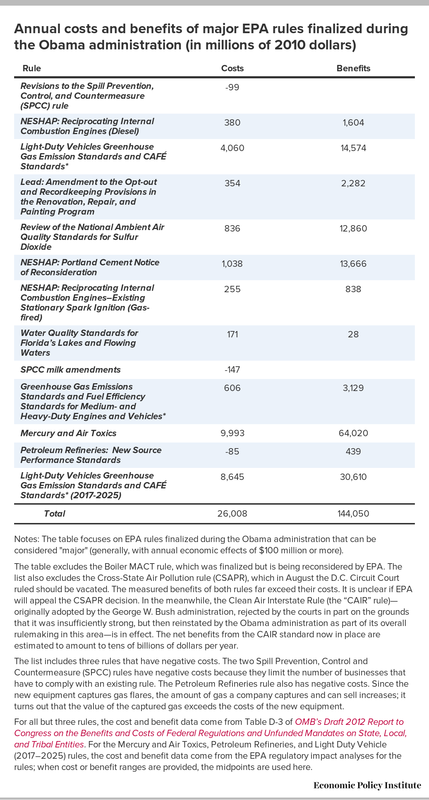 The list also excludes the Cross-State Air Pollution rule (CSAPR), which in August the D.C. Circuit Court ruled should be vacated. The measured benefits of both rules far exceed their costs. It is unclear if EPA will appeal the CSAPR decision. In the meanwhile, the Clean Air Interstate Rule (the “CAIR” rule)—originally adopted by the George W. Bush administration, rejected by the courts in part on the grounds that it was insufficiently strong, but then reinstated by the Obama administration as part of its overall rulemaking in this area—is in effect. The net benefits from the CAIR standard now in place are estimated to amount to tens of billions of dollars per year. The list includes three rules that have negative costs. The two Spill Prevention, Control and Countermeasure (SPCC) rules have negative costs because they limit the number of businesses that have to comply with an existing rule. The Petroleum Refineries rule also has negative costs. Since the new equipment captures gas flares, the amount of gas a company captures and can sell increases; it turns out that the value of the captured gas exceeds the costs of the new equipment. For all but three rules, the cost and benefit data come from Table D-3 of OMB’s Draft 2012 Report to Congress on the Benefits and Costs of Federal Regulations and Unfunded Mandates on State, Local, and Tribal Entities. For the Mercury and Air Toxics, Petroleum Refineries, and Light Duty Vehicle (2017–2025) rules, the cost and benefit data come from the EPA regulatory impact analyses for the rules; when cost or benefit ranges are provided, the midpoints are used here.